We love living in Indianapolis, and we love introducing people to the joys of living here (of which there are many). Here are a few things you need to know before moving to Indy. We like making and watching left turns. We're home to the Indianapolis Motor Speedway, the racing capital of the world. 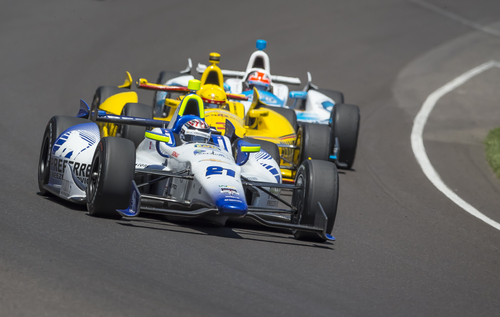 The famous track is home to the renowned Indianapolis 500, the Angie's List Grand Prix, the Brickyard Vintage Racing Invitational, the Crown Royal 400 at the Brickyard, and the Red Bull Indianapolis GP. That's a lot of left turns! We have a canal that will remind you of Venice. Downtown Indianapolis has a beautiful canal that has European-style bridges, Segway tours, gondola rides, and the NCAA Hall of Fame at the end. What's not to love? We (still) love Peyton Manning and hate Tom Brady. Although we adore Andrew Luck, true Colts fans still have a special place in their hearts for Peyton Manning, who hung up his Indianapolis jersey in March 2012 after 14 seasons. Oh, and if you're Coltstrong, you instinctively boo at Tom Brady. People refer to the 500 Festival Mini-Marathon as "THE Mini" because it's the largest half-marathon in the nation, and it's hosted downtown. If you move here, chances are you'll end up participating at least once. If you don't, you'll know someone who has. In the dead of winter, we can have low temperatures in the negatives. In the summer, we usually reach at least 100 degrees. The beauty of our bipolar weather is that we get to experience all 4 seasons! You've never had pork done right until you've had it breaded, fried and placed on a bun that's half its size. You can get them easily at the Indiana State Fair (along with an assortment of other fried foods), but they're also found year-round on some local menus. We like to make our own beer. Craft beers are a big deal here. Local brews are made at Sun King, Flat 12, Fountain Square, Triton, Bier, and Three Wise Men just to name a few. You'll need a designated driver if you want to try them all. We've got some artsy statues. Carmel's Arts and Design District is home to 16 (and counting) sculptures of people that will have you doing a double-take because they look so real. Oh, and we can't forget Dancing Ann, a sculpture downtown that has four rectangular panels with LED screens all displaying an animated image of a woman dancing. She's sure to get your groove on. What did we miss? What do people need to know before moving to Indy? Leave your comments below!